In this urgent call for reform, Prosperity challenges the fundamentals of business thinking. It sets out a comprehensive new agenda for establishing the corporation as a unique and powerful force for promoting economic and social wellbeing in its fullest sense - for customers and communities, today and in the future. economic and social wellbeing of the many, not just the few. Prosperity tells us not only how to create and run successful businesses but also how policy can get us there and fix our broken system. 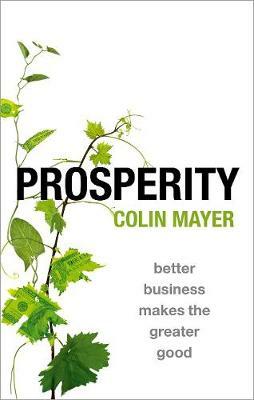 Colin Mayer is the Peter Moores Professor of Management Studies at the Said Business School at the University of Oxford. He is a Professorial Fellow and Sub-Warden of Wadham College, Oxford and an Honorary Fellow of Oriel College, Oxford and St Anne's College, Oxford. He was appointed CBE for services to business education and the administration of justice in the economic sphere in 2017. Colin Mayer was the first professor at the Said Business School, and the first Director of the Oxford Financial Research Centre. He was also previously the Peter Moores Dean of the Business School. He was a Harkness Fellow at Harvard University, a Houblon-Norman Fellow at the Bank of England, and Leo Goldschmidt Visiting Professor of Corporate Governance at the Solvay Business School, Universite de Bruxelles. He is the academic lead for the British Academy's Future of the Corporation research programme, which addresses the changing relationship between business and society.